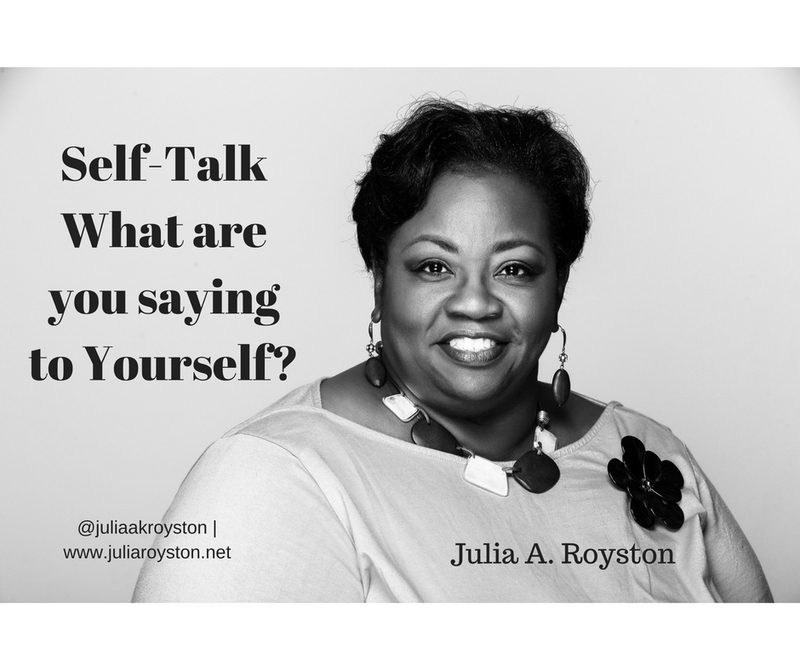 Self-Talk: What Do You Tell Yourself? It was 1963 and the doctor said, “It is a girl!” My parents were thrilled but concerned when they saw that my toes were pointed east and west rather than north and south. For the first nine years of life, there was much time and money spent on doctor visits. “Julia has a terrible speech impediment.” “Julia’s vision is 200/200 rather than 20/20.” “Mr. and Mrs. Foree, Julia has failed the hearing test.” A nurse said in a crowded gym for all to hear, “Julia Foree’s weight is 100 lbs. and she’s six years old.” There have been countless unhappy moments surrounding my weight but, overall, I’ve had a happy life. I have wonderful, loving parents, two sisters who were opposite from me but somewhere behind those grimaced faces they really do love me. In everyone’s life there are good and bad times, achievement, excitement, disappointment and failure. I have had my share. Over the course of my life, I have learned to maximize the positive and minimize the negative. I don’t avoid or run from negativity in my life but I realize that I can’t control others or dwell on their opinion of me. Being the fat girl, wearing glasses with a speech impediment wasn’t pretty and definitely wasn’t fun. As I got older, I had the nerve to shade the lenses color on my glasses. Sometimes it was rose, other times it was brown and once it was even blue. Yuck, what was I thinking but I was trying to make the most of my poor vision by trying to make it as stylish as possible. Surprisingly, I always had friend. I was fun, cute for a fat girl, people often said, outgoing, talkative and gifted. My gift is what saved my life. At nine, I sang my first solo in church and my life changed forever. I had a gift like no other nine-year-old or some teenagers for that matter. Throughout my teenage years, I didn’t have many dates with boys but I had a lot of dates to sing in churches around the city, state and nation. From the eight track player to the record player to the cassette tapes to boom boxes and CD players. I had it all. My parents gave me all of the tools to support my gift. The one thing they couldn’t give me was a positive self-image. I had confidence on the stage, academically above average in the classroom and played a musical instrument through college but when I looked in the mirror, I didn’t see much. I would laugh at myself more than anyone laughed at me. My family often tells me that I wasn’t as fat as I made myself out to be. But, it’s what you tell yourself that counts. Self-talk can demean you more than anyone else can. I had great friends who would defend me against anyone. I went to dances. I went to prom. My family went on vacations every year and in my circle, I was popular. I didn’t live in a dysfunctional family or was abused by anyone. I did every conceivable diet known to man but lost and gained weight repeatedly. It was frustrating but it took a toll on my self-esteem. Remember it’s what you say to yourself, how you see yourself and the boundaries, limits and tolerance level that you place on yourself that matters. Maximizing the positive should have been easy because there were so many positive things going on in my life, but instead, I allowed the one negative aspect of my life to magnify and intensify my poor self-image. In my senior year in college, there was a young man stationed in the military who came to my church. He was handsome, manner able and suddenly took an interest in me. It was a shock to me. I had so little experience that I was hesitant, skeptical and turned him down repeatedly but he didn’t take no for an answer. There were several other young women and their mothers who were certainly interested in him, but he chose me. Finally, I had a good announcement, I had a boyfriend, then a fiancé and then a husband. It was a miracle. It lasted for four years as a couple and eight years on paper. It is now 1993 and the announcement from my ex-husband that ended the marriage was, “My mama says you have to go.” This was clearly the lowest moment in my life. I was more than 1100 miles from home, little money, in my night gown, rollers in my hair, my clothes being tossed into a suitcase by a man who said he loved me but his mama said I had to go so I had to go. This was the last straw of a situation that had too many details to name here but this was finally it. I had had enough of a bad situation. At that moment, it didn’t matter about my weight, it mattered about my life. I stayed that night but the next day, I took action. I quit my job, emptied my bank account, called my father to make arrangements to have someone come and drive me home. I had a safe place to be until they arrived and it was all set. I got home, worked temp services and then enrolled in a graduate program which I completed in one year while working two jobs. I was headed in a new direction with new people to meet, places to go and things to experience. Love Yourself – Sure, I should take care of myself, eat better, exercise more and maybe lose weight but what good is a perfect body with a tormented soul? I first had to fall in love with me. This is not an arrogant, self-centered, self-absorbed, can’t stand to be around her type of love, this is a love of myself so that I can be the best self that I was destined to be. You don’t love yourself when you allow yourself to stay in toxic mental, emotional and financial relationships. Loving yourself is determining the good and abundant life that you want to live and what that looks like for you. Denying yourself that abundant life is not loving yourself at all. Over time, I had to learn how to put limits, set boundaries, be the final approval or disapproval of who and what was going to be in my life. Love yourself enough to take care of yourself, mentally, spiritually, emotionally, financially and physically without fear or regret. Love yourself enough to walk away and don’t look back. Limitless Life – My father always said that I could do anything any human being could do. I not only remembered it but I started doing it. I had no responsibilities to anyone but myself. I was finally going to be true, good and honest to me. I took the limits off of my life and over time, the control out of the hands of others including my family. When I recognized who I really was and realized the life that I could lead, there was no stopping me. I have never been a natural risk taker, but I have taken more risk since 1993 than I ever thought possible. Through tears and pain, I decided as long as I can, breath, think and believe that I can, I can and will. Take the limits off of your life! Live Out My Purpose – I found my purpose as I walked out my journey. It wasn’t a perfect path because I am not a perfect person. I have made mistakes, bad decisions and trusted some wrong people but I acknowledged the mistake, held myself accountable, got back up, got on the right road and got moving even faster than before. I discover more about myself each day, month and year that I live. Each time I say yes to something new, discard the unnecessary, remove all distractions, love without hesitation, I am greeted with a new gift, talent, ability and opportunity to live. Look with New Eyes – When I look in the mirror, I wink, blow kisses and tell myself that I am smart, cute and talented. Sure, I see the defects but call them possibilities. My husband tells me that I’m beautiful, intelligent and that he loves me every day. I am grateful but if he never said it, I have to look myself in the mirror and see someone smart enough, good enough, worthy enough to be a success in every area of my life. It’s how you see yourself and what you tell yourself that matters.